Exercises that focus mainly on the legs moving away from the body can increase the chance for individuals to experience sciatica, especially in athletes who have weaker interior thigh muscles. Lifting is another physical activity that frequently causes sciatica. Athletes who have weaker core muscles can also increase their chance of experiencing a herniated disc while lifting. Improper lifting techniques are usually the root cause contributing to the development of this painful spinal complication. Individuals can work together with a chiropractor or physical therapist to strengthen specific regions, such as the core and inner thighs, to improve the symptoms and prevent damage or injury from future exercises. As an athlete, choosing the proper equipment for a specific sport or physical activity is essential towards improving performance and avoiding injury. Improper footwear could be causing sciatica for many athletes. An athlete’s shoes should fit properly around the foot as well as provide adequate cushioning and arch support, especially for sports or physical activities which involve plenty of running. 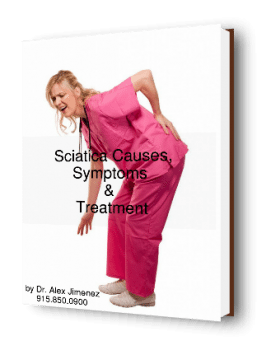 Sciatica symptoms can be treated several ways. Using a combination of both hot and cold therapy may help ease an athlete’s symptoms of pain and discomfort from sciatica. Cold therapy helps numb the tissue as well as reduce the inflammation around the affected region. Hot therapy can help soothe muscle pain and spasms by dilating blood vessels and increasing the amount of oxygen on the affected region. It’s important to follow the appropriate measures to treat an athlete’s sciatica, allowing them to resume back to their exercise routines as soon as possible. For athletes that engage in strenuous training routines, their fitness habits could be the main source for their sciatica. Located around the area of the buttocks, there’s a small muscle known as the piriformis muscle, which functions by supporting the hip and allowing the outward rotation of the legs. But, if this small muscle becomes inflamed and tightens, the symptoms of sciatica may develop. An athlete with weaker interior thigh muscles is at a higher risk of experiencing sciatica. For more information, please feel free to ask Dr. Jimenez or contact us at (915) 850-0900.